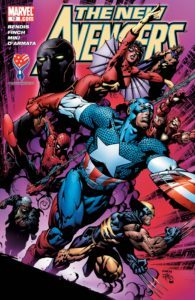 The definitive, chronological, and up-to-date guide on collecting New Avengers (2005) comic books via omnibuses, hardcovers, and trade paperback graphic novels. A part of Crushing Krisis’s Collecting Avengers: A Definitive Guide. Last updated July 2016 with titles scheduled for release through April 2017. The Avengers no longer existed in the wake of Brian Bendis’s shocking Avengers Disassembled, but a breakout from The Raft super-villain prison brings together a team of unlikely allies – classic Avengers Captain America and Iron Man, but also long-time solo heroes like Spider-Man! As they cooperate to wrangle the villains and dig deeper into the mystery of their breakout, they quickly realize they are a team of new Avengers. This title offered an ever-changing cast of heroes who gathered only to be splintered again and again by events like Civil War and Secret Invasion. Altogether, the series descends into one of Marvel’s darkest periods before it resolves back to a unified set of Avengers teams at the end of Seige. 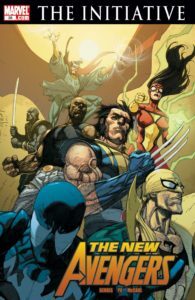 Along the way, scribe Brian Michael Bendis makes some unlikely changes to the Avengers franchise – Wolverine and Spider-Man join the team, and Luke Cage, Iron Fist, Spider-Woman, and Dr. Strange all become fixtures. In fact, after Civil War splinters the team and discards Iron Man and Ms. Marvel there are hardly any “classic” Avengers on the team, save for a disguised Hawkeye! With the launch of this series, Marvel began the practice of releasing an initial “Premiere Hardcover” of each run before offering a trade paperbacks, meaning that there are always two editions of the same book with the same issues collected. Then, later, Marvel issued “Deluxe Hardcovers”to collect multiple editions of the original hardcovers (which quickly fall out of print). Finally, some single issues are also featured elsewhere as a part of event tie-ins or creation collections. Join the Crushing On Crushing Krisis mailing list for a notice whenever this page is updated with new collections – plus, a not-more-than-weekly ping about new comics content. 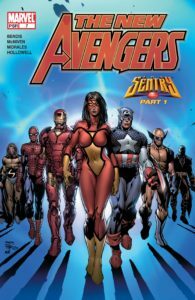 The first modern Avengers Omnibus collects Avengers #500-503, Avengers Finale, New Avengers #1-31 and Annual 1; New Avengers Most Wanted Files; New Avengers Custom 676: Army & Air Force; Giant -Size Spider -Woman 1; New Avengers: Illuminati (2006) 1; Civil War: The Confession 1; and Civil War: The Initiative 1. 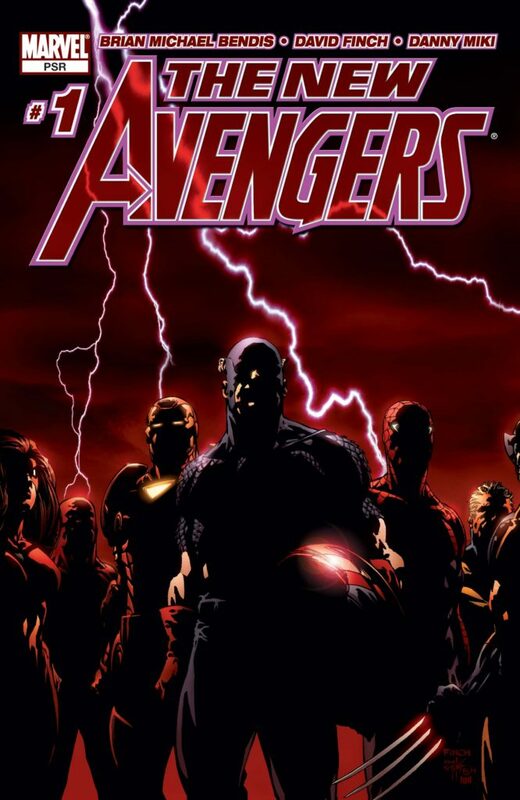 This collection includes Secret Invasion as well as the major tie-in issues written by Brian Bendis. The full contents are Secret Invasion #1-8, Prologue; New Avengers (2004) #31-32 & 39-49; Mighty Avengers (2007) #7 & 12-20; and New Avengers: Illuminati (2007) #1 & 5. A prelude to New Avengers, this is not required reading to enjoy this run, but is frequently collected alongside it, as in the Omnibus, above. Collects Avengers #500-503 and Avengers Finale. Captain America and Iron Man appear in Young Avengers #1-6 during this Avengers-less gap. Collects the Vol. 1 and Vol. 2 TPBs of New Avengers, plus The New Avengers: Most Wanted Files (2006) #1. Captain America and Iron Man appear in Young Avengers #7-12 prior to House of M.
See Marvel Universe Events: House of M for the oversize collection of the alternate reality story that ran alongside New Avengers; it fits between #10 and 11. Collects the Vol. 3 and Vol. 4 TPBs of New Avengers, plus New Avengers Annual 1, which also appears in The Pulse, Vol. 3: Fear. See Marvel Universe Events: Civil War for Civil War oversized collections. Collects the Vol. 5 and Vol. 6 TPBs of New Avengers, plus New Avengers: Illuminati, and Civil War: The Confession & The Initiative, which are not included in Volumes 5-6 (though they are reprinted elsewhere). Here New Avengers becomes the “unregistered” team of rebel avengers, prominently featuring Ronin (AKA Hawkeye), Luke Cage, Spider-Woman, Wolverine, and Spider-Man. Other team members are featured in Mighty Avengers and Avengers: The Initiative, which both start here. Why does this only collect the same issues as the Vol. 7 TPB (including Annual 2)? The next New Avengers arc is Secret Invasion, which would merit its own Deluxe-sized hardcover. 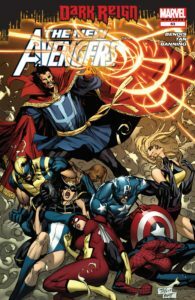 Without a second New Avengers arc to collect, this Deluxe adds the companion five-issue limited series, New Avengers: Illuminati (available in hardcover). 12-issue maxi-series. This series occurs after New Avengers #38 and acted as a sideline adventure while the book mostly addressed the history of Secret Invasion. Effectively a New Avengers: Secret Invasion collection, this does not add any bonus issues beyond the contents of the Vol. 8 and Vol. 9 TPBs. See Marvel Universe Events: Secret Invasion for the oversize Secret Invasion event collection. Dark Avengers begins here, usurping the roles (and costumes!) (and names!) of the Mighty Avengers. A four-issue limited series focusing on Mockingbird’s reintegration into the team after Secret Invasion. Includes the contents of Vol. 10 and Vol. 11 TPBs, plus the Avengers Free Comic Book Day issue from 2009. Collects the contents of Vol. 12 and Vol. 13 TPBs. See Marvel Universe Events: Siege for the oversize collection of Siege, which repeats some issues from the final New Avengers oversize hardcover. This series of all-encompassing collections was solicited at the end of 2016. Collects Avengers (1998) #500-503, 500 Director’s Cut, and Finale; New Avengers (2004) #1-10, and 1 Director’s Cut; and New Avengers Most Wanted Files. This reprint line continues with New Avengers (2010). The original sequence of collections collected in their initial release trade paperbacks and hardcovers. See Marvel Universe Events: Secret War for the story that acts as an optional prologue to this series. Available in hardcover (ISBN 0785118144). Also collects The New Avengers: Most Wanted Files (2006) #1. Available in hardcover (ISBN 0785119388). See Marvel Universe Events: House of M for the alternate reality story that ran alongside New Avengers. Also includes a short story from Giant-Size Spider-Woman #1. Available in hardcover (ISBN 0785119396). Available in hardcover (ISBN 0785119868). This story emerges from the conclusion of House of M. Alpha Flight continues from this story and Civil War to Omega Flight. A one-shot introducing the Illuminati. Collected with oversized editions of this run, and also in The Road to Civil War. See Marvel Universe Events: Civil War for the main Civil War event collections. This is the story that sets up the divide between several Avengers teams (and books) continuing through 2010. Reprinted in 2016. Available in hardcover (ISBN 0785122427). To fully understand the full context of the story you should also read the main Civil War series (also available in hardcover and reprinted in 2016). Available in hardcover (ISBN 0785124454). Also collects Annual 2. Available in hardcover (ISBN 0785125027). A 12-issue maxi-series featuring the New Avengers and Mighty Avengers teaming up to assist the Invaders, displaced in time from the close of World War 2! This series occurs after at least the first arc of Mighty Avengers. This story is not written by Brian Bendis, so it is not referenced in the main New Avengers series. Unravels a secret history of the Marvel Universe as guided by Iron Man, Mr. Fantastic, Professor Xavier, Black Panther, Namor, and Black Bolt. This retcon has been widely adopted and ultimately leads to the Marvel Now edition of New Avengers. Helps to set up Secret Invasion. Available in hardcover. Available in hardcover (ISBN 0785129464). Available in hardcover (ISBN 0785129480). This is also roughly the chronological start of the Secret Invasion limited series. See Marvel Universe Events: Secret Invasion for the main Secret Invasion event collections. This slim collection also includes Secret Invasion: Dark Reign, which helps bridge the gap between the final issue of the Secret Invasion limited series and the next arc. Available in hardcover (ISBN 0785135596). A four-issue limited series focusing on Mockingbird’s reintegration into life after Secret Invasion. Available in hardcover (ISBN 0785136894). Available in hardcover (ISBN 0785145753). Also collects Annual 3, New Avengers: Finale, and Dark Reign: The List – Avengers. Available in hardcover (ISBN 078514577X). See Marvel Universe Events: Siege for the events surrounding this end of this volume. Collects modern Avengers debuts and joining issues, including The Avengers (1996) #1, The Avengers (1998) #1, 4, & 27, Dark Avengers (2009) #1, The Mighty Avengers (2007) #1 & 21, and New Avengers (2005) #3 & 15. Highlights major BMB stories including New Avengers #15 & 22, plus Alias (2001) #10, Civil War: The Confession (2007) #1, Free Comic Book Day 2009: Avengers, Stan Lee Meets Dr. Strange (2006) #1, and a number of Ultimate Universe comics. Collects New Avengers #16, Amazing Fantasy (2004) #18-19, and Untold Tales Of The New Universe issues D.P.7, Justice (2006), Nightmask, Psi-Force, & Star Brand. Collects the major Avengers team and solo titles connected to Civil War, with the exception of Spider-Man. Includes New Avengers #21-25, Captain America (2005) #22-25, Iron Man (2005) #13-14, Ms. Marvel (2006) #6-8, and one shots New Avengers: Illuminati (2006), Civil War: The Confession (2007), Civil War: The Initiative (2007), Daily Bugle: Civil War/Fallen Son Special (2007), Iron Man/Captain America: Casualties of War (2007), and Winter Soldier: Winter Kills (2007). This could alternately be called “Prelude to Secret Invasion.” In addition to four New Avengers issues, this also collects Fantastic Four (1961) #2 [the introduction of Skrulls], Avengers: The Initiative (2007) Annual 01, The Mighty Avengers (2007) #7, and New Avengers: Illuminati (2007) #1 & 5. Continue to Avengers & New Avengers (2010 – Present).